There are about 450 species in the eastern Himalayas that are not found in the western Himalayas, which is what we are researching. We are not investigating how bird species form, but how they spread their range. 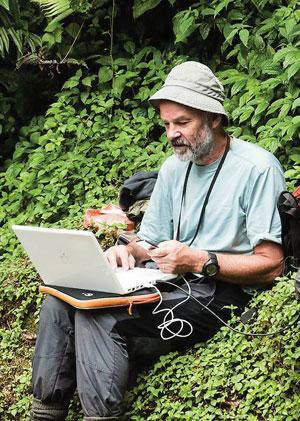 The most recent species found in the eastern Himalayas was the Himalayan Forest Thrush in January last year by Swedish evolutionary researcher Per Johan Alstrm. Will more bird species be discovered in the eastern Himalayas in the future? There are probably one or two more species to be discovered. You have to separate the species that you see in one place from those you might see in two different places. So clearly, we are going to discover that some of the species in Meghalaya are different from those in the Himalayas. The discovery of new species in one place is going to be very difficult. We could discover one or two new species in the eastern Himalayas, but it will take many years. Does the richness of biodiversity in the eastern Himalayas also extend to other life forms such as mammals, reptiles, amphibians and fish? We do not know enough about fish and reptiles. But in general, across the world, there is a very strong association between different life forms. The eastern Himalayas is a very poorly studied region for some of these life forms. But as far as we know, if you look at reptiles, amphibians and mammals, you are going to find that the eastern Himalayas are the second or third-most diverse region in the world and should be studied more. Research suggests that on average, each eastern Himalayan songbird species has been separated from its closest relative in the region for 6-7 million years. This is roughly about the same length of time that humans and their closest relative, the chimpanzees, have been separated. Does your work have lessons for the study of human evolution? Human evolution is unique because by having a big brain, we have changed our environment, which, in turn, has changed us. Animals, on the other hand, are not doing that. They are just reacting to their environments, without modifying it. If you compare a chimpanzee with a human, you would agree that they look pretty different. But birds, even if they are separated for the same length of time can look extremely similar. A chimpanzee has not changed very much in the last 6 million years, but humans have. So we have not seen this aspect of evolution. Why are the tropics more biodiverse than temperate regions? That’s the big question. It is over 150 years now since British naturalist Alfred Russell Wallace asked it. And we are still struggling to find the answer. There are two hypotheses. Let me explain them through the prism of the Himalayas. According to one hypothesis, since the eastern Himalayas are more tropical as compared to the western Himalayas, the eastern side is warmer and wetter with more plants and food. So the eastern side is packed with species. The other hypothesis says that about 20,000 years ago, the western Himalayas had very few animals. Thus, most species got confined to the eastern side. There is also a historical explanation that tropical areas are stable; and, there is the modern explanation that the tropics are rich in food. But investigating which side is more important has been difficult. We have made some advances in the Himalayas and have gathered evidence for both these hypotheses. Research shows that a warming climate is affecting the breeding habitats of birds across the world. Can we overcome global warming? I believe that if India gets richer, then people will value biodiversity and biodiversity will enrich everyone’s lives. My sense is that there will be a revolution and we will never hit the 20 rise, the limit set by the Paris Agreement. At present, we have cheap oil and we are emitting more CO2. But in a few years, we are going to move towards a carbon-free system. India itself has such great solar resources. I feel climate change will be in our control one day. What we have to do is to make sure that biodiversity survives till then. What have you discovered about bird migrations from northern Asia to the south via the Himalayas? I have not studied bird migrations in detail. But recently, we were in the Kanchenjunga National Park—at 4,000 metres above sea level—and we saw a duck that breeds in Russia, but spends its time in the winter in the plains of northern India sitting on a lake. Of course, there are other famous examples like the bar-headed geese landing on glaciers. But studying migration these days has become an enormous task because you can now track birds using technology. As is well known, ornithologist Salim Ali led a movement to ring birds. The bird ringing programme in India stopped in the last 20 years. But fortunately, it is beginning once again, and the first birds were given geolocators to figure out whether they go over the Himalayas during their journey.